A great place to unwind in this beautiful and tastefully furnished Sanctuary! Located on the 10th floor (just under the penthouse). 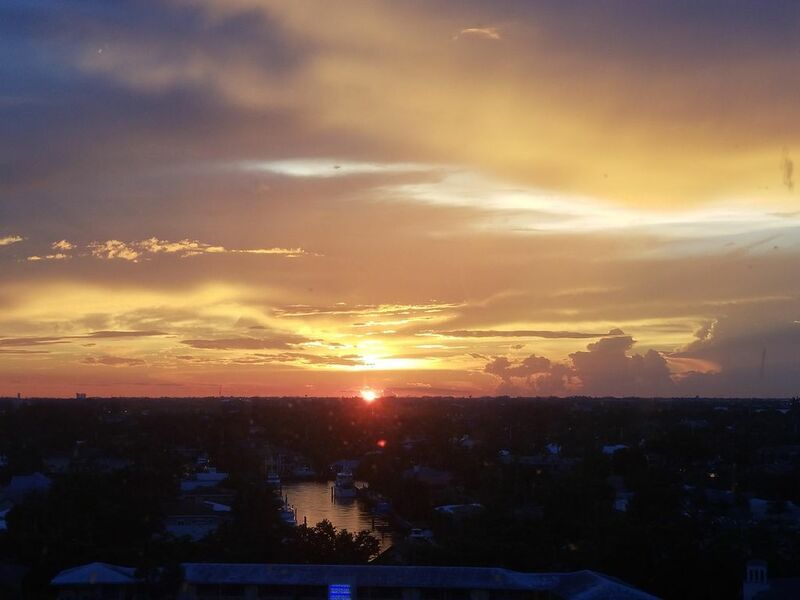 This unit offers amazing views of the Intercoastal waterways and the Sunset. Location, Location, Location... Clean new Updated unit..Italian Restaurant, coffee shop, beauty salon, and The Only TIKKI BAR on the ocean. Kitchen has a cooktop, Coffee Pot, Toaster Oven and all the gadgets and pots and pans, needed - not to mention it has coffee and filters, spices, and other helpful kitchen items to make your stay easy! A high top table with chairs for breakfast time or happy hour while watching the sunset! A screen TV with cable and equipped with private & secured Internet. Located on the Ever Popular "GALT OCEAN MILE" Walking distance from the Grocery Store, Drugstore, Liquor Store, Nail Salon , Restaurants, and Boutiques. You are also walking distance from Lauderdale By The Sea which offers shops, restaurants and even live music at times. I live in the building so I will be here to welcome you and assist you in any way I can. Lyft and Uber everywhere a car is not needed. Growing up in Michigan we used to come to Florida every year on vacation! I always dreamed I would have a place of my own in Florida. I wanted a place that I could call my home away from home and that others could stay at and feel the same way. An oasis with a spectacular view! Location, location, location. There isnt a better location for a building in Fort Lauderdale. Very conveinent as well as having the private beach/Tiki bar was enough for me . Look at the pictures, reviews, and pricing. No unit in this building or others can offer the quality in ammenities at these rates. TheTiki Bar, the extremely detailed and upgraded unit, awesome view, great weather, Hotel quality bedding and linens. Memory Foam mattress, Brand New Flooring, Bedding, Paint, Kitchenware and Appliances. The Sunset!!! Newly stained Vanity and Mirror with new Light - All new Guest towels and a great shower. Their is a nook with bar stools you can eat at and a Bistro Table with chairs. There is A winn Dixie across the steet, a CVS, Dunkin Donuts, Starbucks Restaurants Liquor stores, shops nail salon all in walking distance!